What’s not to love about blueberries? They’re sweet and tart—and they’re good for you. The berries are low-cal (a one-cup serving contains about 80 calories) and full of fiber (nearly four grams per one-cup serving). 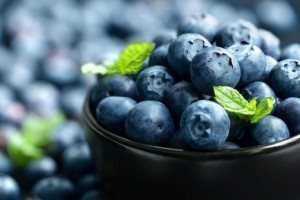 They also contain vitamin C.
Blueberries may be good for your heart, since they may help lower blood pressure. They contain an antioxidant that may help reduce the risk of cancer, and they’ve also been shown to improve insulin sensitivity among people with prediabetes (the condition that puts you at higher risk for developing type 2 diabetes). And you might be surprised to learn that they may actually help reverse memory loss. So give one of these recipes a try. They won’t disappoint! You might not think of blueberries as a condiment, but you might be surprised by how delicious they are when combined with a savory ingredient. Whip up some blueberry chipotle ketchup and substitute it for barbecue sauce. It tastes great on chicken and Portobello mushrooms. For the recipe, click here. You can’t go wrong with a blueberry streusel cake—especially one with a brown sugar topping. Try this delicious recipe. Everyone in your family will want a sip of the blueberry pie milkshake! It’s incredibly simple to make. All you need to do is puree a piece of blueberry pie with vanilla ice cream in a blender. Get the recipe here. Homemade blueberry ice cream is sure to be a hit among your family and friends. And it’s so easy to make—just combine blueberries, sugar, salt, milk and heavy cream. You’ll find the recipe here. 40NORTH and our Culinary team work to have blueberries seasonally in most of our restaurants. We hope you have a chance to try them out! Whether it is in a signature cocktail at George & Martha’s or a dish from our Farm to Table menu at The Black Horse Tavern, we know you will enjoy them.